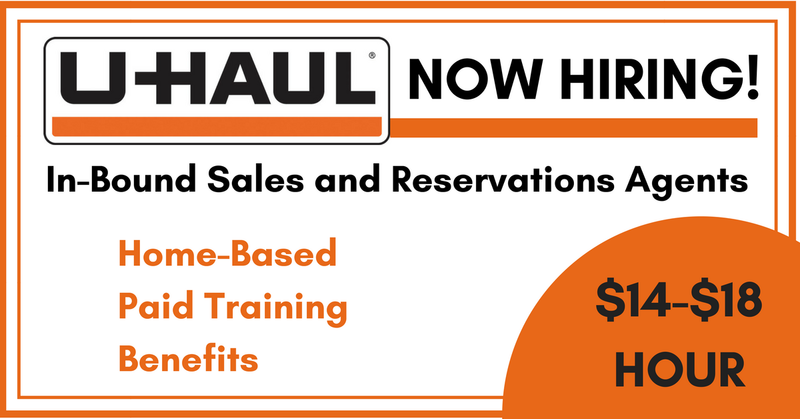 Many RRRebels are already working for U-Haul and report that they enjoy their roles with the company. So, we make sure we post here whenever they post new work from home openings. U-Haul just posted openings for In-Bound Sales and Reservations Agents in the US. “Reservation agents take back to back incoming calls from customers utilizing both the U-Haul toll free 1-800-GO-UHAUL phone number and customers calling specific U-Haul Moving Centers across the U.S. and Canada. Agents answer general product and rental inquiries, as well as secure and schedule reservations for U-Haul trucks, trailers, towing devices, hitches and storage rooms. Working Mondays, Fridays and one weekend day is required. You must be able to work one weekday availability option and one weekend availability option below. The options below represent when you are available to work. You will have the option to select your preferred day(s) off for Tuesday, Wednesday, Thursday. Three weeks of instructor-led paid training/education. Week one is accelerated classroom education with an instructor. Week two and three are hands-on education in small groups with an instructor. After initial education work independently with additional continued education courses and counseling from the manager, assistant manager and team coach. Payment of bonus is determined weekly and paid $2.05 per piece of equipment reserved. There is no bonus during the education/training period. After training new team members starting in week four through eight of employment will qualify to earn bonus if they achieve 3.0 confirmed reservations per hour worked. Starting week nine of employment team members will qualify to earn bonus if they achieve 3.25 confirmed reservations per hour worked and are in compliance with a weekly monitored call. You must have a USB, non-wireless headset. You must have broadband/high speed internet (see requirements below). You must have a PC or laptop (see requirements below). You are required to install and use company programs. You are required to install and use a company provided anti-virus software and may not have/use any other anti-virus software according to PCI (payment card industry) standards. Mobile hot-spot, tethering, satellite ISP or similar. Compute stick, tablet or similar device. Rental, rent-to-own or public PC/laptop. Working in a public place or using a public internet connection. Minimum speed: 2MB upload and 5MB download with a ping below 70. Preferred speed: 5MB upload and 10MB download with a ping below 70. Click here for full details and to apply. For more jobs like these, see our Newest Jobs & Gigs page. To be the first to hear about jobs like these, like our Facebook page. Good luck in your work from home plans! This entry was posted in Customer Service Jobs, Hiring Companies, Work at Home Jobs and tagged U-Haul. Bookmark the permalink.